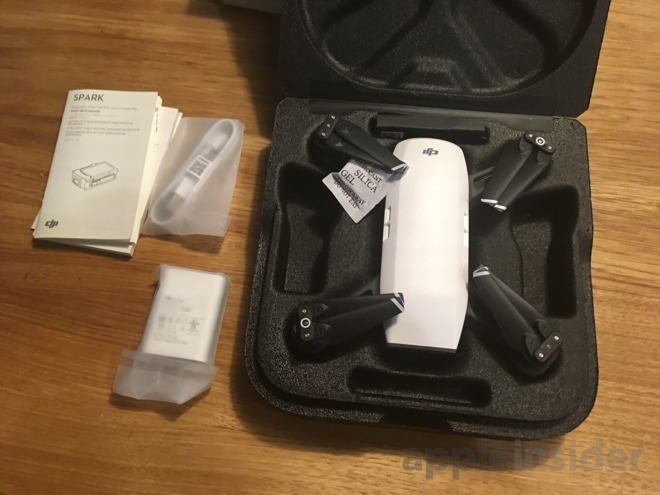 The first DJI Spark orders are now on their way to customers, and AppleInsider offers a first look at what comes in the box with the diminutive new gesture-controlled flying camera, which aims to make it simpler than ever to fly a drone. 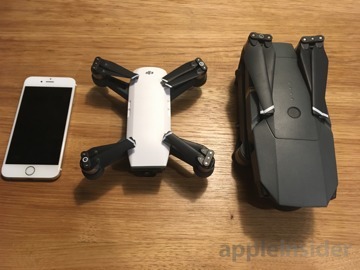 DJI Spark next to iPhone 6s. Impressively small, the main chassis on the DJI Spark is about as tall as an iPhone SE. The Spark is small enough to fit in your hand, which is how DJI expects most users will take off and land the device. Previously, DJI's most portable drone was the Mavic Pro and its unique fold-up design. The tiny Spark makes the more powerful Mavic Pro look absolutely colossal when seen side by side. It weighs 300 grams and measures 143 by 143 millimeters, with a height of 55 millimeters. 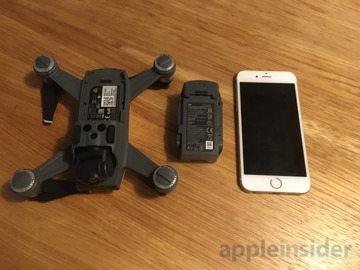 The DJI Spark does not ship with a physical controller in its base $499 configuration. But users can connect to DJI's official iOS app to control the device with an iPhone or iPad, flying over Wi-Fi up to 109 yards away. We think one of the more popular features, however, will be new gesture controls that allow users to fly, take pictures and land by just using their hands within 10 feet of the device. 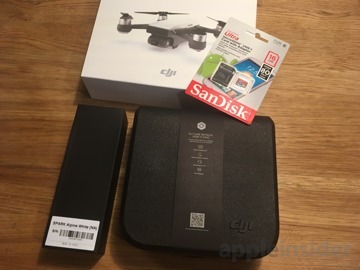 After flight is complete, users can then turn to DJI's app to transfer pictures and video to edit and share. If you want to use a controller, however, you can add on an optional one. 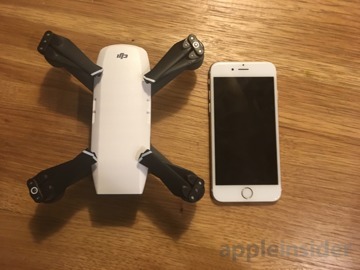 The device is also compatible with DJI's Goggles for an immersive in-flight viewing experience. A welcome inclusion with the Spark packaging is a lightweight foam case. 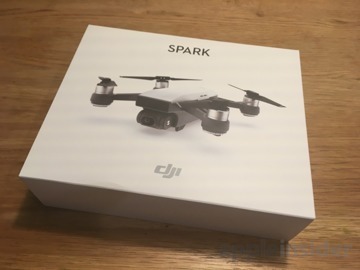 While not an expensive addition, this will make it easier to transport the Spark without damaging it. 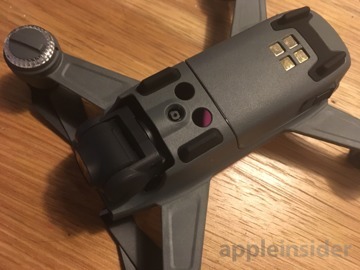 That's especially important because, unlike the Mavic Pro's folding arms, the Spark's arms are rigid to ensure rigidity in flight. DJI says the Spark offers up to 16 minutes of active flight time, with a top speed of 31 miles per hour in sport mode. A built-in micro USB port allows the removable battery to be charged when connected to the Spark without an adapter or external charging accessory. 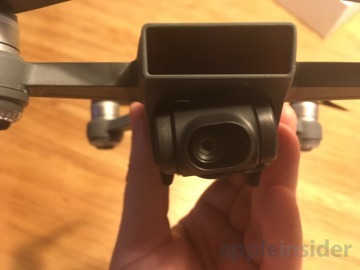 The camera has a two-axis gimbal to stabilize footage, capable of capturing 12-megapixel photos and 1080p video. 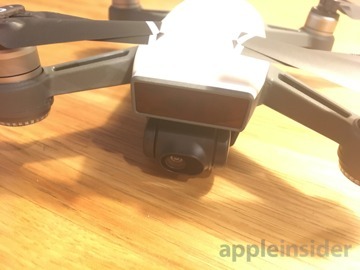 the lens itself has a 1/2.3-inch sensor, and the device also boasts a range of flight and ground sensors, including GPS and obstacle avoidance technology. When purchased direct through DJI, the Spark comes with a free 16-gigabyte micro SD card. 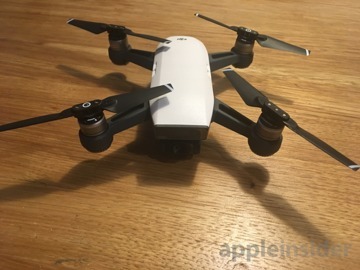 AppleInsider partner B&H is also accepting DJI Spark orders with free expedited shipping and no tax outside of New York and New Jersey. 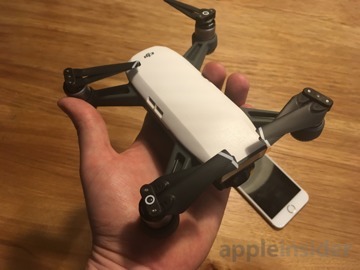 AppleInsider will have much more on the new DJI Spark in the coming days, including our full review, after we take to the skies.